There is no vehicle today that doesn’t need a floor jack. All car owners and car mechanics understand how necessary it is to have a functional floor jack. 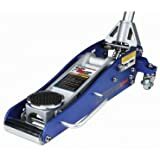 Automotive floor jacks are compulsorily important especially as tools for jacking up or lifting up your vehicles for the purpose of effecting repairs underneath the vehicle, such as replacing brake pads or changing a flat tire in the middle of nowhere. Automotive floor jacks come in various brands, differs in quality, weight, and functions. Some are built with hydraulic power systems; some thrive on the mechanical power systems, while some brands combine both the mechanical and hydraulic systems to form a hybrid Automotive Floor Jack. In this article, we shall be reviewing the Top 10 Best Automotive Floor Jack suitable for your car maintenance. Before we go down to the book of revelation chapter review of the top 10 best automotive floor jacks in 2019, it is imperative that we look at some of the things we should consider when purchasing a floor jack. The Scissors Jack—which often comes with new cars. They are small and portable. They also can be used to undertake tasks like changing tires. The Hydraulic Jack—these class of jacks can give you a lift higher than all other jacks. They make use of hydraulic cylinder to achieve their aim. This is the jack that most professionals favors. The Bottle Jack—like hydraulic jacks, bottle jacks also uses hydraulic but within much compact hydraulic rings. They’re good for high lift but unsuitable for low-riding vehicles. So, which one do you prefer? Ask yourself. Secondly, you need to figure out WHAT TYPE OF VEHICLE you’re going to lift. Is your vehicle low to the ground? You will need a jack that can sneak under it with ease. Is it heavy? You will need a jack with more power to lift it. Consider this before making your choice. Lastly, you may want to consider WHAT BRAND TO BUY. In this case, you have to do the necessary online research by reading customers reviews to determine the consistency and tenacity of the producer. This will go a long way to help you in purchasing the right product. Top 10 Best Car Waxes Reviews! 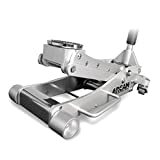 We are starting our Automotive Floor Jack Reviews 2019 with the Arcan ALJ3T Floor Jack. The Arcan is a professional aluminum floor jack that has a lift capacity measuring 3 Tons and a minimum lift height of 3-3/4 inches. It is very suitable for vehicles with a low profile. Every piston on this floor jack has a protective dust shield to prevent hydraulic contamination and allow the jack to pump smoothly. 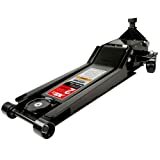 You can maneuver this floor jack with ease and is very stable with smooth rolling performance good for trucks, vans, and SUVs. The Pro-Lift F-767 Floor Jack has a place in our review due to its extremely low price and yet effective Jack ability. This 2Ton floor jack can give you better access to low-ground vehicles and with it; you can lift your vehicle up to a range of 14 inches. The maneuverability is awesome, and its steel construction ensures durability. The Pro-Lift has a bypass device that safeguards it from over pumping, as well as safety valves that protect it against overload. This is yet another sleek, low profile, and a durable floor jack from Arcan. The Arcan XL2T is a 2Ton steel service and extra low profile jack designed to allow users get below and lift almost all vehicles you can think of. It has a dual pump for quick lifting, and it can go 2.75 to 24 inches in height. This Jack complies with ASME PALD authorize standard, and so you can be sure to use it. This is a jack constructed with durable, aircraft aluminum billet, and with just 3-1/2 inch pumps; it is capable of lifting almost every vehicle. 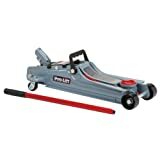 The 1.5Ton Aluminium Racing Floor Jack is designed with two pieces of knurled aluminum handles for a perfect grip and is also equipped with foam bumper to prevent damage to the vehicle. The jack weighs 26.8 pounds, and it has 90 days warranty as a boost. Torin is a household name in the floor jack market, and this Torin Scissors floor jack can be your car’s trunk perfect companion. Made of rugged alloy construction, with heavy-duty steel frame and saddle; the Scissors can lift your vehicle from 3 3/4 to 15 3/8 inches in range. The 4 1/2 extra wide base provides for easy positioning while the folding handle means it can be used speedily when necessary. Here we have another 3Ton Jack from Torin with SUV height extender that saves time and makes it easy for you to lift higher vehicles. With this jack, you can handle any garage or on-road emergency repairs whether on cars, SUVs, or pick-ups, with less effort. It can be maneuver with ease, and it has a lifting range of 5-7/8Inches to 20-7/8Inches. If there is anything, you need to lift in your garage or shop; count on the Powerbuilt Floor Jack! This floor jack can lift vehicles up to 6000 pounds capacity, with its patented jack stand and bottle stand design all combining to form one unit. The wide steel base ensures load stability, together with the safety bars that locks unit on the desired height. With its 11-21 inches height range, it is perfect for all SUVs on and off-road jack-lifting purposes. The Powerzone is a 3Ton Steel and Aluminium Garage Jack capable of lifting vehicles from 4inches to 18-1/4 inches in height. It has a lightweight aluminum frame and a heavy duty steel lift arm that provides strength and durability. The safety valves prevent overloading, and the quick hydraulic system saves your time on maintenance. The rubber padded saddle and the foam handle both protects your vehicle frame from scratches during use. What else do you need in a floor jack? 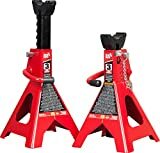 The TorinT43002A increases productivity by the use of Torin Big Red 3Ton Ratchet Action vehicle stands to give perfect support to your vehicle. This floor jack features a double-locking capability, together with a safety pin design that adds additional security when working under your vehicle. This Jack is fit for all your road and garage car maintenance works and is duly certified by the relevant authorities. And finally, our best and top brand for the Top 10 Best Automotive Floor Jacks in 2019, is the Torin T43002 Jack Stand. This is the king, and the reasons are simple—safety, quality, and price! 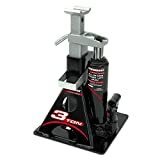 The Torin T43002 is a 3Ton Floor jack that’s made of high-grade quality steel to meet the best standard and durability. It comes with a self-locking multi-positioning iron ratchet bar that provides you with precise adjustment. Furthermore, there is a large saddle surface area that gives better contact with that part of your vehicle being supported, and this jack has a supporting range of 11 1/4 to 16 3/4 inches. It also meets all ASTME safety standards and is the highest selling product in the market today. From what we have explored so far in our review of the top 10 best automotive floor jacks in 2019, it’s clear that floor jacks are necessary tools, and the best are those with high lifting range, added security, portable and solid in quality. Feel free to choose any of the products we have painstakingly reviewed; they all have the capacity to deliver the required service.